There was a time when little bags or plastic boxes were acceptable to store make up, but no. We can make it all look beautiful as it sits on our shelves or on our counters or dressing table. Even those who have built in storage in their vanity tables and dressing tables would love to have what I am about to show you. Ever since the beautiful Kim Kardashian showed them for only a second or two on her television show, the craze caught on. It's almost as if people believe that if you store your make-up like Kim, you can look like Kim. As many look-a-likes as there are, I know that I could never look as wonderful as her, but what did I do? 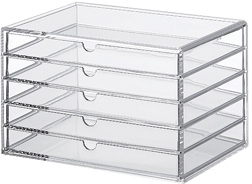 I travelled about an hour and a half to Muji and bought these clear acrylic cubes to store my growing collection of make-up. Not even skin care, just make-up. I bought 4 drawer sets ( 1 x 3 drawers, 2 x 5 drawers and 1 x 2 drawers with the flap lid), 1 envelope holder which holds small palettes and 1 desk tidy for my brushes and some of my foundations. 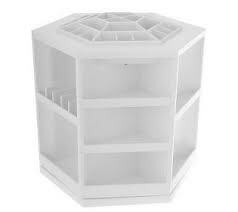 I do love them a lot better than the plastic boxes I had, I have to admit. Another idea would be to keep it all in a train case. It is easy to travel with and can easily be organised However, one it is full, you either will have to buy a bigger one or another one. You are limited on space. I am still in the search for more innovative ways to store make up. When something awesome comes out. You all will be the first to know. To buy? Definitely invest in the QVC carousel. You will find some use for it. Not to buy? If you have a Vanity or dressing table, it may have been completely irrelevant to you and I'm sure you have a better spread than me. Click on the video below to watch my make-up collection and storage video. Thank you for the tip. I will definitely look into it. best makeup products. Hope in future you will also providing more stuffs on skin care. Thank you for your kind words. I will definitely be posting more skincare reviews soon.